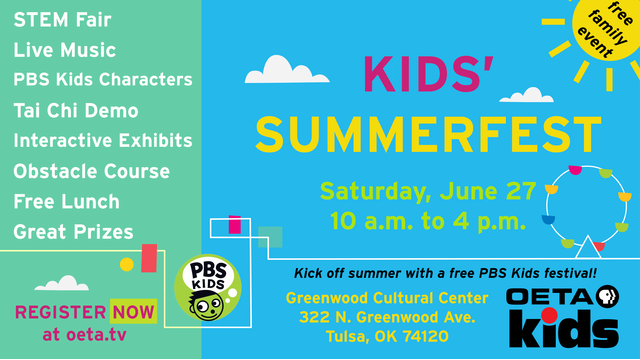 OETA will host its first annual free PBS KIDS SUMMERFEST on Saturday June 27 from 10 a.m. to 4 p.m. at Tulsa's Greenwood Cultural Center at 322 N. Greenwood Ave. The free event will offer live music from performers including Red Dirt Rangers, Spaghetti Eddie, Sugar Free All-Stars, Al Bostick and more, plus a PBS KIDS character parade, Mighty Kids tai chi demonstration, interactive storytelling and exhibits, an obstacle course, free water and picnic lunches, and a special Stem Fair experience that provides materials for kids and parents to work together on a stem project and compete for prizes. The event is open to all, but parents wishing to register with their child for the STEM Fair are encouraged to register in advance. Watch oeta.tv for details, including the performance stage schedule, PBS KIDS character lineup, activity descriptions.